Doha, Oct 23 (IANS) The US secretary of State Rex Tillerson said that Saudi Arabia is not ready to talk to Doha to end the months-long diplomatic crisis, local media reported on Monday. 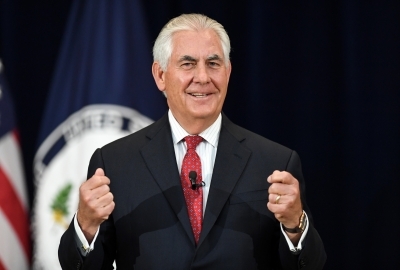 Tillerson made the remarks during his ongoing visit to Qatar, where he held a joint news conference with Qatar’s Minister of Foreign Affairs Sheikh Mohammed bin Abdulrahman al Thani, Xinhua news agency reported. Qatar is committed to the Gulf Cooperation Council (GCC) system, al Thani said, adding that the country is also willing to push for a dialogue in resolving the dispute. Tillerson’s visit to Qatar followed a stop in Saudi Arabia, where he attempted to resolve the Gulf dispute. Commenting on his Saudi visit, Tillerson said Saudi Arabia is not ready to talk to Doha and his mediation bid received no positive response by Riyadh. “In my meetings with Saudi Crown Prince Mohammed bin Salman, I asked him to please engage in dialogue, but there is not a strong indication that parties are ready to talk yet,” said Tillerson. The US official, who also met Qatari Emir Sheikh Tamim bin Hamad Al Thani, expressed concern about the effect of the crisis on the region’s security and stability. Saudi Arabia, Bahrain, the United Arab Emirates and Egypt cut diplomatic and economic ties with Qatar on June 5, accusing it of supporting terrorism and cozying up to Iran. Qatar categorically denied the allegations. Qatar is home to the largest US military base in the Middle East, where over 11,000 soldiers are stationed.